Tomas Milian, Giuliano Gemma and Eli Wallach star in Sergio Cobucci's unimpressive comedy Spaghetti Western. DVD Storm R0 Italy. The Spaghetti Western was at its creative height between 1965 and 1969, but it kept on going into the 1970s, with lower budgets and more comic than serious films. By the middle of the decade it had almost died out and it was to this atmosphere that Bianco, Giallo, Nero was released, clearly aiming to be more comedy than Western. The film does have a few good laughs, most notably in the cabaret sequence with the three leads forced to go "undercover" and there are some scenes that are quite humourous simply because they are so bizarre - notably the appearance of a motorbike - however most of the jokes are of the "fart" variety with many of those around the dopey Sakura character bordering on offensive. With quite its slow pacing, the film does drag on quite a lot (especially since it runs to over 100 minutes). Fortunately the ending is strong and surprisingly tense, while the epilogue is the funniest part of the film. Sergio Corbucci was one of the Spaghetti West's big names - evident from him receiving billing alongside the actors on the opening titles, but as the genre declined so did his output. Except for the well shot the final battle scene, the rest of the film shows little flair, and could have been shot by anyone. Composers Guido and Maurizio De Angelis (best known for their distinctive score for Keoma (1976)) provide the music here, and it is fittingly bizarre. The film does boast a strong cast. Giuliano Gemma was not the biggest Italian genre star, but he seems to be enjoying himself as the ingenious Swiss, while American star Eli Wallach is well suited to the role of Black Jack. Tomas Milian gets the most controversial role, playing the Japanese Sakura and saddled with a rather terrible accent and script, but at least puts his heart into the role. 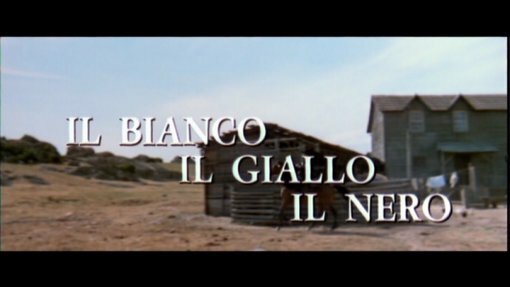 Il Bianco, Il Giallo, Il Nero is certainly not the best film in any catagory and some viewers might find it simply offensive, but fans of the genre might enjoy its daft and occasionally enjoyable comedy. Not recommended. Directed by anyone	interesting? Sergio Corbucci - one of the best known Spaghetti Western directors, responsible for the revolutionary Django (1966) and the dark Great Silence (1969). Any gore or violence ? Lots of death, no blood. Who is it for? For genre and director completists only. Picture quality is pretty good, although some scenes are notably blurry. Audio Italian 5.1 and original mono - sounds good, but the surround track is rather unimpressive. English mono - sounds fine throughout. Subtitles Italian - based on the Italian soundtrack. Samurai - an featurette including interviews with Nori Corbucci (the director's wife), actors Guiliano Gemma and Nazzareno Zamperla, composer Maurizio De Angelis, and the film's editor Eugenio Alabiso. (19 minutes, no English options). Availability Italian release. DVD title Il Bianco, il giallo, il nero. An occasionally enjoyable film, with some slight hints of Corbucci's talent, but generally uninteresting and not recommended. The DVD has a good print and audio, although the interesting looking interview sadly lacks English options, and otherwise the disc is feature-free. Find our other Spaghetti Western and Sergio Cobucci DVD Reviews. All text in this review written by Timothy Young - 19th September 2007.